Shri Arun Jaitley, Minister of Finance, Corporate Affairs and Information & Broadcasting has said that the conventional calendar still retained its special place despite the latest trends in technology. The Government of India Calendar 2016 would take forward the developmental agenda of the government highlighting one developmental theme or focus area each month. Each calendar sheet emphasized a particular goal and priority area which concerned the people at large. Shri Jaitley stated this while releasing the Government of India Calendar 2016 on the theme ‘Vikas ki Nayi Udaan’ today. Col Rajyavardhan Rathore, Minister of State for Information & Broadcasting and Shri Sunil Arora, Secretary, Ministry of Information & Broadcasting were also present on the occasion. Elaborating further, Shri Jaitley mentioned that the outreach of the calendar enabled the message of the key initiatives of the Government to reach the Panchayats across the country. The calendar emphasized the national priorities and goals of the government through developmental themes like Mudra Yojna, Beti Bachao Beti Padhao and Smart cities which affected the people at large. The calendar also reiterated the power of the development message that formed part of the national agenda concerning people and households across the country. Col Rajyavardhan Rathore while launching the digital version of the 2016 Calendar said that the Calendar 2016 had several features to reach the target audience especially the youth and citizens who sought information on programmes and policies. He further stated that success of the schemes of the Government depended largely on the awareness levels of citizens. Shri Rathore said that the Calendar 2016 fulfilled this purpose and its e-version also enabled people to give feedback to the government. It also gave them access to PIB press releases, tweets and news from AIR and DDnews. The digital version of the calendar would facilitate the information flow to the youth who were quite aware of new techniques and methods. The Minister also highlighted the initiatives being taken by DAVP to facilitate online functioning including enhancing outreach and promoting transparency. There was also an idea within DAVP to come up with advertisements targeted at specific audiences. 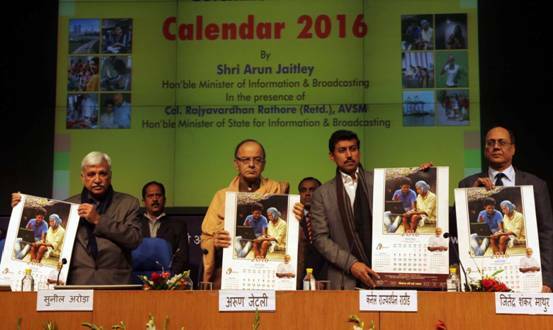 The Government of India Calendar 2016 has been designed and printed by the Directorate of Advertising and Visual Publicity (DAVP). It is printed in 11 languages apart from Hindi. It is distributed to all Panchayat zilla parishads, centrally aided schools; all missions abroad apart from all elected representatives Central Government Gazetted officers. With the theme ‘Vikas ki Nayi Udaan’ the Calendar highlights various developmental schemes launched by Government of India. It centers on Beti Bachao Beti Padhao , Mudra Yojna ,Smart cities, PMKYV, Jan Dhan Yojna, Digital India, Health , Power and Employment for all , farmers’ welfare, port-led development. The Calendar 2016 ends with Ashtalakshmi that lays stress on development in the North East. The Department of Posts is responsible for distribution of the Calendar across the country. January month displays dream of creating livable and sustainable Smart Cities. The mission was launched by the Hon’ble Prime Minister Sh. Narendra Modi on 25th June 2015. February month is based on theme of Beti Bachao Beti Padhao for survival, protection & education of the girl child. The programme was launched in Panipat by the Hon’ble Prime Minister Sh Narendra Modi on 22nd January 2015. May month shows importance being given to Healthcare facilities where thrust is on optimally utilising every rupee spent on Healthcare. Empowerment of Poor through Jan-dhan Yojana is the theme of June month. Launching the yojana on 28th August 2014 the Prime Minister had referred to the ancient Sanskrit verse: Sukhasya Moolam Dharma, Dharmasya Moolam Artha, Arthasya Moolam Rajyam – which puts the onus on the state to involve people in economic activity. August month talks about Electrification of Villages within specified time limit. September month talks about Employment opportunities for all. .
October month shows the important place that farmers have in Indian Society and highlights concern of government for farmers. November month speaks about giving thrust to development by developing Port Infrastructure. Sagarmala project is the key highlight. December month highlights the focus given to development of North-eastern areas.